According to sources, the EC’s “umbrella order” will also apply to the 10-part web series Modi: Journey of a Common Man which is currently being streamed on Eros Now platforms. The ban isn’t just limited to public screening of the films, but also applies to display of posters and publicity material related to them in print and electronic media. 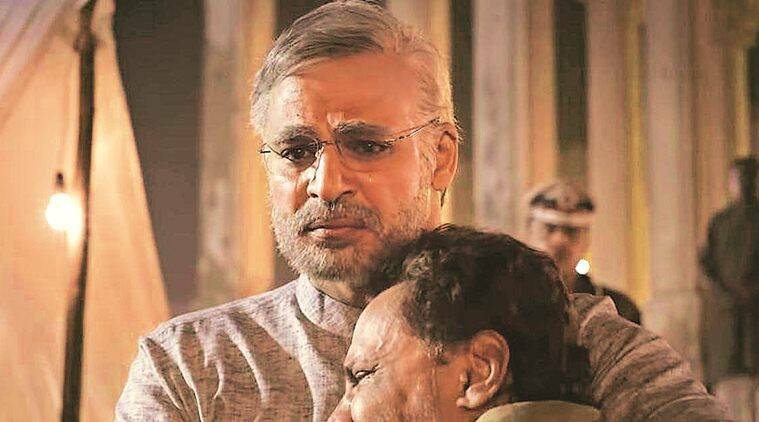 THE ELECTION Commission (EC) on Wednesday deferred the release of PM Narendra Modi, the biopic starring actor Vivek Oberoi, “till further orders”, a day before its scheduled release. In a separate order, the poll panel also imposed a ban on public screening of “any biopic material in the nature of biography/ hagiography” which could serve the interest of a political party or candidate, while the Model Code of Conduct is in force. The order was sent to the Information and Broadcasting Ministry, the Central Board of Film Certification (CBFC) and all state Chief Electoral Officers. Following the EC’s directive, the CBFC, which certified the biopic on Tuesday, wrote to the film’s producers — Anand Pandit, Suresh Oberoi, Acharya Manish and Sandeep Singh — asking them to defer its release till the elections are over. N T Rama Rao and Udyama Simham on Telangana Chief Minister K Chandrashekar Rao’s struggle for the separate state of Telangana. According to sources, the EC’s “umbrella order” will also apply to the 10-part web series Modi: Journey of a Common Man which is currently being streamed on Eros Now platforms. A copy of the order, The Indian Express has learnt, will be sent to the Ministry of Electronics and Information Technology. The order came a day after the Supreme Court dismissed a petition seeking a stay on the release of PM Narendra Modi, and left it to the EC to decide “whether the film will tilt the electoral balance in favour of any political party”. The Model Code of Conduct, in its present form, doesn’t explicitly prohibit screening of films based on a candidate or a political party. Hence, the EC invoked its extraordinary powers under Article 324 to stop the screening of the biopics. The EC recalled that “in catena of judgments, Hon’ble Supreme Court has held and acknowledged that the Model Code of Conduct, which ensures free and fair electoral process, which is sin[e] qua non for the electoral democracy”, and said that it was of “the considered view that there is an emergent need for intervention in the matter of those ‘political contents’ which are intended (or purported to be) for benefitting or discrediting the electoral prospect of any candidate or/ and any political party, for ensuring a level playing field”. “And therefore, it is in the larger interest of ensuring the level playing field and conduct of free and fair elections that such political content ought to be regulated during the election period to prevent violation of Model Code of Conduct,” it said. As for future complaints with regard to violations of the Model Code of Conduct in films, the EC said a committee headed by a retired Supreme Court Judge or a retired Chief Justice of a High Court would vet them. The EC is expected to announce the name this week. “The EC guidelines apply to a biograph in cinematograph format but not one in the print format. In this case, we are governed by clause 4 of the EC guidelines, which states that in cases like ours, a committee consisting of members of HC and SC will be formed, which will decide on a ban. We have not received any notification of any such committee having been formed to consider our case. Is it not premature to ban the film then,” he said. “The Model Code of Conduct states that if a candidate is an actor, then the film can be released everywhere but on Doordarshan. Then why is this film facing a problem,” he said.